The centrepiece in Mr Mark Siow’s spare room is a Christmas-themed retro television set. In Mr Mark Siow's home, it is never too early to get started on decorating for Christmas. Every November, the Christmas enthusiast stows away his regular home decorations and takes out his collection of Christmas ornaments. Up go the snowmen - in various shapes and sizes - reindeer plushies, angel sculptures and snow globes filled with dreamy winter scenes. An entire display shelf in the living room is lined with a variety of Christmas figurines. Small Christmas decor items are also placed in his bedroom, spare room and on the kitchen table. He lives in a four-room flat in Marine Parade with his mother. The 48-year-old assistant manager in a bank says he loves decorating. "It's also the festive season and I want to do something special to celebrate it." A tourist sits on an inflatable seat while wearing a Christmas hat and celebrating Christmas Day at Sydney's Bondi Beach in Australia, December 25, 2016. German tourists Mimi Wiebeling and Pauline Lapetite carry surfboards as they walk into the surf wearing Christmas hats at Sydney's Bondi Beach on Christmas Day in Australia, December 25, 2016. German and British troops participate in a football match to commemorate the Christmas Truce of 1914 at the ISAF Headquarters, in Kabul, Afghanistan December 25, 2016. Student volunteers, wearing the uniform of the World War II-era Hong Kong Volunteer Defence Corp, walk on a zebra crossing as they raise public awareness of the Battle of Hong Kong in the territory's Wanchai district on Christmas day, December 25, 2016. This Christmas marks the 75th anniversary of the colonial British surrender of Hong Kong to Japan following the 18-day Battle of Hong Kong in 1941 during World War II, where local volunteers and Commonwealth troops fought in vain to defend the territory. Indian Christians gather around a figurine of the baby Jesus as they celebrate Christmas in Bhubaneswar on December 25, 2016. Palestinian President Mahmoud Abbas attends the Christmas Midnight Mass in Saint Catherine's Church at the Church of the Nativity, where Christians believe the Virgin Mary gave birth to Jesus Christ, December 25, 2016 in Bethlehem, West Bank. People light candles during a mass on Christmas at Alexander Nevski cathedral in Sofia, Bulgaria, December 25, 2016. A group of choir sings the holy songs during a Christmas mass in Colombo on December 25, 2016. People gather by a Christmas tree near damaged buildings during Christmas eve in al-Hamidiyah neighbourhood in the old city of Homs, Syria December 24, 2016. An Iranian woman lights a candle during Christmas Eve mass at the St Joseph Armenian Catholic church in Tehran on December 24, 2016. Iraqi Christians dressed as Joseph and Mary attend a Christmas eve mass at the Chaldean Catholic Church in the northern city of Kirkuk on late December 24, 2016. Indonesian Christians attend a Christmas Eve service at a church in Surabaya, East Java province, on December 24, 2016. Sudanese Christians sing during a Christmas eve mass at the St. Matthew Catholic church in the capital Khartoum in the late hours of December 24, 2016. Pope Francis carries the statue of baby Jesus during a mass on Christmas eve marking the birth of Jesus Christ on December 24, 2016 at St Peter's basilica in Vatican. French adventurer Capitaine Remi Le Calvez dressed as a Santa Claus, starts a trip as a hitchhicker in Paris, France, December 6, 2016, to travel to Rovaniemi in central Lapland, northern Finland. The Eiffel Tower is shrouded in fog behind a fountain illuminated for the Christmas holiday season at the Concorde Place in Paris, France. A giant Ferris wheel lights up the night sky for the Christmas holiday season behind a fountain and in front of the Louxor's Obelisque on the Place de la Concorde square in Paris, France. Christmas holiday lights hang from trees to illuminate the Champs Elysees avenue in Paris as rush hour traffic fills the avenue leading up to the Arc de Triomphe, France. The Printemps department store is illuminated on the occasion of Christmas ahead of the holiday season in the French capital Paris, France. The Credit Lyonnais bank headquarters is illuminated on the occasion of Christmas ahead of the holiday season in the French capital Paris, France. People stand near Christmas trees in front of the Vendome Column as part of Christmas holiday season illuminations at Place Vendome in Paris, France. The Vendome Place is illuminated on the occasion of Christmas ahead of the holiday season in the French capital Paris, France. A view shows the shop window of Printemps department store in Paris during the launching of Christmas lights ahead of the holiday season in the French capital, France. A child looks at a Christmas holiday window display outside the Galeries Lafayette department store in Paris, France. A man takes a photograph of a Christmas holiday window display outside the Galeries Lafayette department store in Paris, France. Children look at a Christmas holiday window display outside the Printemps department store in Paris, France. People look at a Christmas holiday window display outside the Printemps department store in Paris, France. Paris Mayor Anne Hidalgo (centre) and France's Olympic and World judo champion Teddy Riner (centre top) attend the ceremony to inaugurate the Christmas holiday lights on the Champs Elysees in Paris. Actress Uma Thurman launches the Christmas lights of Printemps department store in Paris ahead of the holiday season in the French capital, France. He spends at least a day taking out the ornaments - they are bubble-wrapped and packed neatly in boxes when the season is over - and spends the next few days moving them around to get the look he wants. He estimates that he has collected about 100 decoration pieces over the past decade, when he first started doing up his home for Christmas. He previously lived in a three-room flat in the same area and moved in 2013. The bachelor says: "Every year, I will add one or two new ornaments and replace old ones that are worn out. But most items are still in good condition since I bought them because they are of good quality and well-kept." Mr Siow, who also decorates his home for Chinese New Year, Halloween, Deepavali as well as for his niece and nephews' birthday parties, looks for Christmas ornaments with unusual designs and colours. Sometimes, he picks up pieces from Christmas markets overseas and has snagged good buys at a post-Christmas ornament sale in Bangkok. He even hand-carried from Spain a 5kg musical snow globe that lights up. He says: "I saw it in a store and knew I just had to have it. It's so beautiful and magical. " His biggest piece is a life-sized, retro television set that lights up and displays a scene of a village covered in snow, with a train running through. It cost him about $1,000 and is the centrepiece in his spare room. Ironically, he does not have a Christmas tree in his home as he says he does not have the space. Instead, a small "naked tree" that has only branches and LED lights - decorated with some baubles - sits on the television console. Two brass trees - one is 0.8m tall and the other 1m - that were previously used in a window display for a clothing store, stand outside his home. While the decorating takes a lot of effort, Mr Siow says: "Seeing the impressed looks of my family members makes it worthwhile." 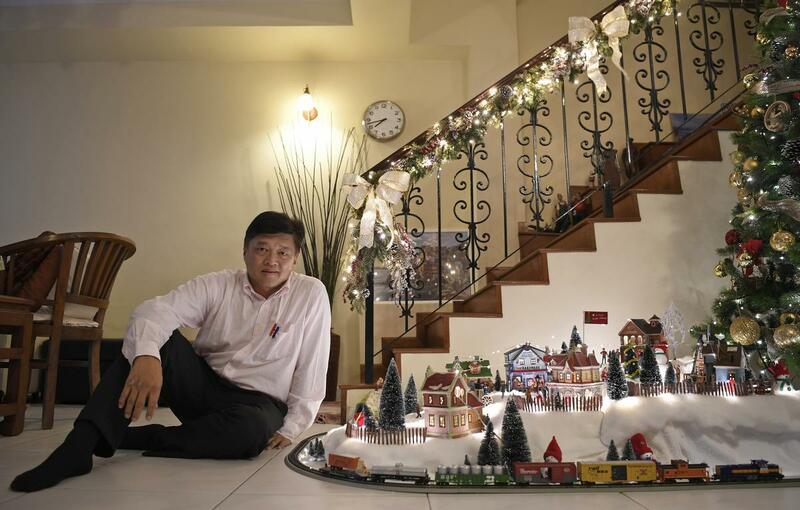 Every year since 2012, Mr Steve Tai, 57, has been building up his miniature Christmas village, which he sets up during the festive season. From just three houses and a handful of figurines, the village - which sits on a blanket of cotton-wool snow and is lit with twinkling lights - now has seven houses and 25 figurines. This year, he also rolled out a new miniature train set with tracks. He got the idea for a Christmas village when in 2012, a friend living in the United States posted photos of his family's decor on Facebook. "I was inspired. At that time, my youngest daughter was living in the US, so I got her to buy back some miniature houses to start our own Christmas village," says Mr Tai, who is vice-president of new business at paints and coatings company Nipsea. 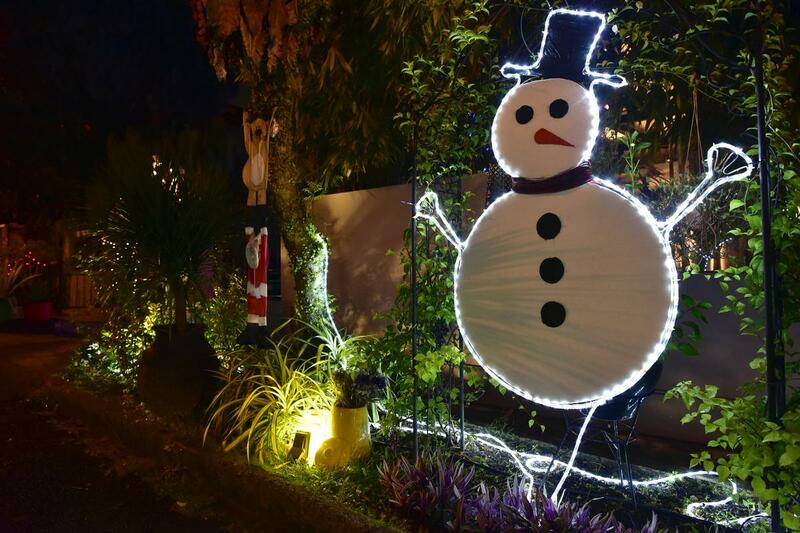 The father of three daughters, aged 28, 25 and 23, adds: "This year, we also added street lights, a customised village flag and snowmen that my second daughter and I made together." Setting up the village is a laborious task that typically takes three weekends. Mr Tai, a trained engineer, starts by designing the topography and lighting. He says: "I first build the multi-tiered foundation with boxes before laying down ground lights and 'snow' using sheets of cotton wool. Having a multi- tiered foundation gives the village more dynamism and a more interesting look. It also allows each house to be better showcased." The village scene, which measures 1.2m by 2.7m, is placed beside their Christmas tree and the whole set-up sits next to the staircase on the ground floor of their three-storey terrace house. Elaborate ribbons also adorn the bannisters - an idea Mr Tai picked up from watching YouTube videos. When it came to decorating the tree, he says he relied on tips he picked up from the lead stylist at Tangs, from whom he has been buying Christmas decorations for years. "It's all about layering - using multiple layers of lights and different textures on the tree in various depths to achieve the same richness. He adds: "It's also important to layer correctly. We use the matte-textured ornaments as the innermost layer, followed by shiny baubles that reflect light near the light sources. "Larger ornaments are placed on the outermost layer and we top off the tree with ribbons and sequinned leaves that mimic snow-laden branches and foliage." Mr Tai says he spent about $1,500 on the tree and village, which have led to many delighted guests taking photos and asking questions about his efforts. Anyone passing by the Lims' home in Seletar Hills Estate during the festive season would probably stop in their tracks. After all, Mrs Audrey Lim, 57, and her 58-year-old husband, Mr Richard Lim, have created a Christmas wonderland outside their two-storey semi-detached house. There is Frosty the Snowman, which the couple made from styrofoam and wireand adorned with lights. A plastic ornament of Santa and a reindeer hangs from a tree. An American-style mailbox post dressed in candy stripes - with a wreath embellished with glowing bulbs hanging on it - stands near the driveway entrance. A large blue-light ornament in the shape of a Christmas tree hangs above the entrance to the house. Mrs Lim, a piano teacher, says: "We've been dressing the house for Christmas for more than 30 years." She and her husband bought the house in 1991, but spent intermittent periods in the United States because of Mr Lim's job as a pilot. They settled back home for good in 2010. Their younger daughter, 26, lives with them, while their 29-year-old daughter lives in Paris. As a child, Mrs Lim says she used to attend Christmas parties at Victoria Concert Hall, which sparked her love for the holiday. "I've always liked the warm, fuzzy feeling of Christmas." During their time in the US, she noticed that "decorating the outside of the house was a big thing". "One neighbour had an entire moving train - big enough for children to fit in -around his garden. It took him about three weeks to put up his decorations," she recalls. As a member of the Seletar Hills Estate Residents' Association, she wants to bring that spirit to Singapore by starting a competition for the best-dressed house. In the past three years, about 10 houses on average participate each year. "Some people may be reluctant to take part as outdoor lighting is harder to find than standard lights," she says. She adds that she does not take part as she is one of the judges and she has had "a head start". Still, she is heartened by the compliments from passers-by, who stop to take pictures or ask questions. She is already thinking of what to do next Christmas. "We were thinking we could do candy-cane wire sculptures such as the ones we just saw at the Botanic Gardens." At the parties thrown by Mrs Sharene Chen-Johandyputra, the table settings look like they come straight out of a Martha Stewart home decor book. Decorated with eucalyptus coin leaves, Kenyan roses, spray roses, pine cones and a sprinkling of Christmas firs, her dinner table is a picture of rustic elegance. The 31-year-old, who works in the financial sector, has long had a love of decorating. "Even in my teenage years, I've always liked making things pretty," says the mother of a two-year-old girl. She also runs a floral design and gifting company, Pastel Hues Design, which she started last year. She describes her signature style as "soft, dreamy and romantic". The festive season gives her the chance to organise dinner parties, where she combines her passion for decor with her love of hosting. She has organised two dinners this month and will have a more casual gathering tonight. "If there's an opportunity to host, I'll do it. I love having flowers, good food and friends around," she says. She, her 32-year-old husband, who also works in the financial sector, and their daughter live with her in-laws in a condominium - they will move to a place of their own next year. Even though it takes her only 45 minutes to set up, she says her guests often lament that the table is "too pretty to even touch". Her table settings, which include flowers, napkins and tablecloths, cost between $100 and $120. She cites Style Me Pretty: Living, an American lifestyle blog, as inspiration for her decor in general. To achieve the dreamy look, her go-to flowers include garden roses and peonies. "You need much more flowers than foliage for this look," she says. So, what are her decorating tips? "Have a colour palette and theme in mind. It helps you to stay focused and consistent with the design you're trying to build," she advises. 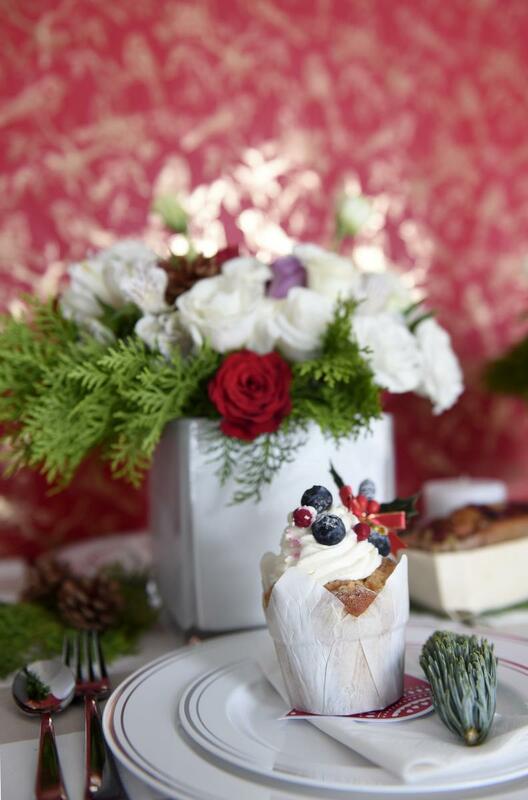 For example, her Christmas tablescape was designed with the theme of nature and rusticity in mind, so she used more foliage as well as red, green, white and brown colours. She adds that fresh flowers can "add warmth and a touch of magic to the overall look". Lastly, lighting is important. "Add some sparkle by using candles or fairy lights," she says.